I got home this morning and walked in to find Yogi happy as a clam. 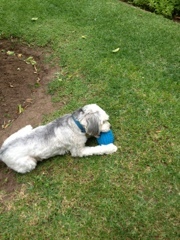 I walked through the gate and he ran straight to his new blue ball. Mum had been shopping. She'd said to me the other day that she wanted to get him something too big to fit in his mouth. (That's what she said!) I think of the big yellow ball that doesn't fit but quickly became the flat yellow ball after he'd gotten a hold of it. He was a horror head last night. The lawnmower guy came this morning so Yogi couldn't go out. Yogi wanted to go out. Yogi was quite adamant from about 815 that he was going out whether I liked it or not. I pointed out I had opposable thumbs and the door was shut. He responded by jumping onto me. Several times. He woke me up a few times last night so I was exhausted today. I went to have a nap but every time I had almost drifted off Yogi was barking to tell me that I wasn't allowed to. I also popped around to see Yattie Da Evil Cat. He was very happy to see me. He almost turned his back on me to show me how unimpressed he was at being abandoned when he realised I didn't live there anymore and that I was coming around to give him a pat and a cuddle. Plus, I broke out the liver so I was Ms Popular! He was heading into my old room when I left. We didn't hit up the park today so there were no war wounds on the puppy. 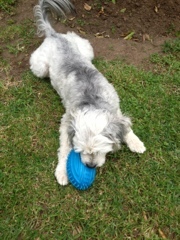 He loves his new toy for here though. Squeak!